How about owning a UPS that could even replace a flower pot on your table, due to its sheer elegance? It might sound a bit bizarre, but the attractive all black cabinet design of this device is just the one that would add grace and value to your computer table. V-Guard Slender Plus 600 - value-for-money device that comes with loads of advantages and useful features is the perfect UPS that offers efficient back up to your desktop computer/router. Designed to be a full-equipped UPS system, Slender Plus 600 offers voltage regulation, surge suppression and the required power back-up support for personal computers. It also has an internal UPS circuit built to it to support entry level PCs with amazing effectiveness. Moreover, it continuously regulates brownouts and over voltages to usable levels, even while maintaining the battery charge intact. 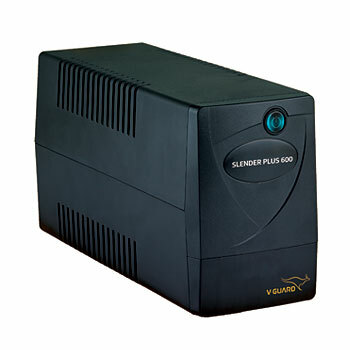 Switch on to Slender Plus 600 from V-Guard. You will be surprised for sure.